It’s that time of year – time to head to the apple orchard, pick apples and enjoy all the recipes that are available right now. We are blessed to have many apple orchards here in Northwest Indiana and they are ready for picking. 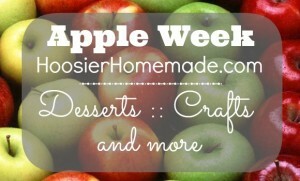 Last year we shared a few recipes for Apple Week and had such a good time, we thought we would expand it a few more days and also share recipes on Pocket Change Gourmet. 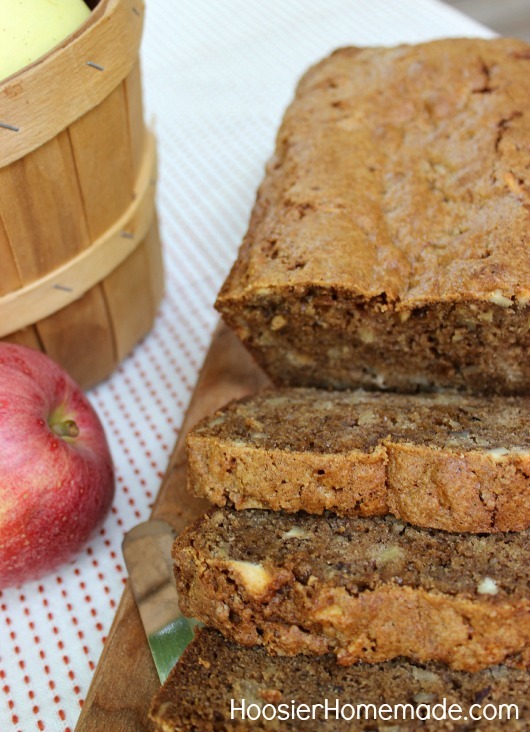 This Apple Bread boasts all the flavors of Fall with delicious Fuji apples and apple pie spice. Quick bread is definitely some of the easiest bread you can make. Typically the bread goes together in minutes and has many different flavors, a couple of my favorites are Pumpkin Bread and Zucchini Bread, I have made both many, many times and we love them. 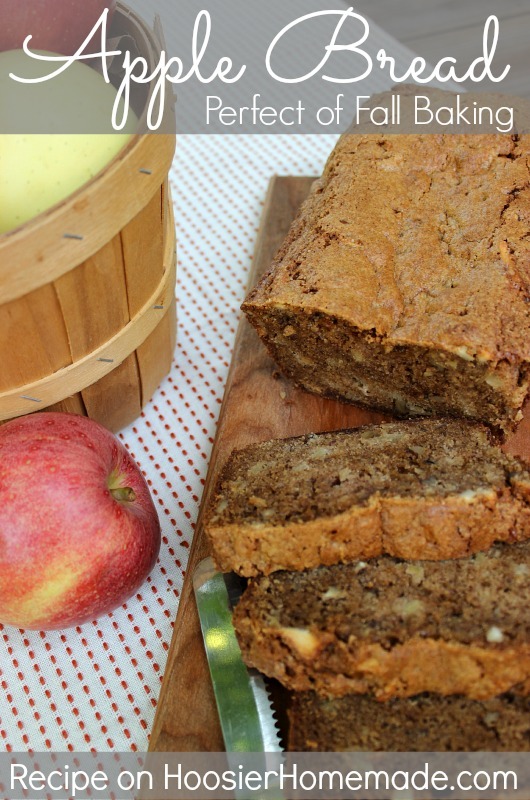 Gooseberry Patch is one of my favorite cookbook authors, this Apple Bread is adapted from Sunday Dinner at Grandma’s Cookbook. I found this recipe through Pinterest and am very excited to try it! In the past, particularly with brownie recipes, I’ve replaced oil with the same amount of apple sauce to make my baked goods a little healthier. Does anyone know if that would work with this recipe as well? I’ve never made a quick bread so I’m not sure if it would turn out differently! Hi Sarah, I have not used applesauce in place of oil in quick bread. But I know other bakers that have. This recipe though is very dense and moist, so I’m not sure how adding more moistness with the applesauce will work. But it’s definitely worth a try. Advice…I made this bread this morning. Like the comment above my bread was extremely thick. I baked both pans for 50 minutes. One pan was done, the other wasn’t so I kept it in a few minutes more. Both breads completely sank in the middle…Any advice as to why this happened? Hi Cristal, sorry that happened. Sometimes apples have a lot of water or liquid which can effect the batter. It seems like perhaps I need to bake this bread again and see what happens. I just mixed this up and it’s VERY thick, the recipe says to pour batter into pans but it cannot be poured. I had to spoon it in. Is it supposed to be this thick?? Hi Karen, the batter will be thick because of the apples, honestly I don’t remember it being very thick though. You can certainly divide the batter the best way for you. If your batter is extremely thick, you may need to adjust the baking time, because it would make the bread very dense. I want to try to make these as muffins. Suggestions on cooking temperature? Time? Hi Julie, I bake all muffins at 350, I would test them after 10 minutes and go from there. I baked this exactly as directed as far as I can tell… the first loaf I did for 40 minutes, checked it, and let it cook another 15 minutes. The second I set for 50 minutes and it still didn’t seem done so I let it go another 10 after that… The first one is very gooey but the second one almost seemed burnt on the outside… but neither one looked like a real loaf of bread. Maybe I used too much apples? I tasted them both and they both taste great, they just don’t seem like a bread. But this seems to happen any time I try to bake a quick bread… they never come out right! Any tips? Hi Amanda, quick breads are different textures than yeast breads. Also in my experience, when you bake with apples the baked good is moist. I think it also depends on what kind of apples you use. Also every oven and pan are different. I’m sorry, that’s not very specific. Thanks for the recipe. I only have 1 bread pan so I used it and my Pampered Chef Brownie pan and filled the cups 3/4 full and baked for 25 minutes. I have just started baking and I am not sure exactly what Fuji Apples are and where I can find them. If I cant find them, can I substitute a different type of apple? I am anxious to try this recipe this weekend and I want to make sure I do it right if I have to substitute anything. Thanks for the great inspiration for this baking newbie!!!!! 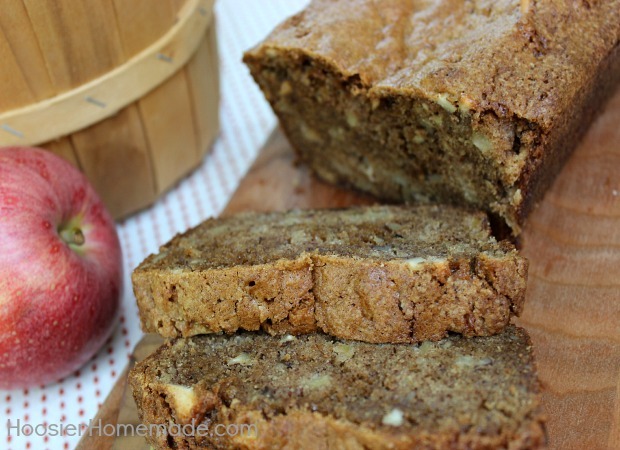 This apple bread looks amazing! Cannot wait to try it! I cannot choose between all the yummy apple recipe or pumpkin recipes which is my favorite for fall…must,eat.them.all! Thanks so much Heidi! I totally agree, I love all the flavors of the Fall season. lol That last part was supposed to read: Thank you so very much for all of your recipes and Talent. You did it to me agan. When I opned your e-mail I thought I have enough apple bread recipes and then I opened it and it lookd so good I saved it. Between you, Brucrew Crew Life and Hugary Happenings, Iam ging to win because I will have the most and best recipes whenI I die. Than you s vey uch or ll of your recipes and talets. Best Apple Bread I have ever tasted. We ate one entire loaf at supper. Sooooo good!